1.) The World Building: CITY OF ISLANDS is set exactly as the title suggests: on a city of islands. Each island has its own character and design, and the focus on the ocean as such a central part of live is amazing. I have read many fantastic middle grade fantasies, but I haven't felt as much warmth and magic from a fantasy world since Hogwarts. Wallace deftly creates an environment both beautiful and dark, home-like and entirely different at once. The characters are truly tied into every part of the physical and magical world around them in ways that isn't shown in other fantasy worlds. 2.) The Writing: While I have enjoyed Wallace's previous books before, her writing blew me away in CITY OF ISLANDS. From the lush descriptions of the water to the lyrical prose to the creative magic songs, I wanted to wrap myself up in the words like a blanket. 3.) The Action: From the first chapter, you know exactly what is at stake for Mara. She's mostly alone in the world, she fights daily for survival, and she has dreams of finding and doing more. As plot twist after plot twist happens, your heart will race, and your hands will be frantically turning the pages. There are times when no characters' motives are clear, when some make surprising choices, and with each discovery, the stakes build and build. In the last 100 or so pages, I was so tense following the plot that I nearly bent the book clutching it. 4.) Mara: Mara is everything I wanted in a protagonist: brave, steady, and curious. She is extremely likable, and readers will root for her from page one. She is understandable, and though her circumstances are often heartbreaking, she has a tenacity and perseverance that doesn't let up, not completely. 5.) The Conflicts: There were many times I was never quite sure who was on whose side. Mara is far from naive and understands that the motivations of people around her are often based on their own best interest, which is not always great for herself. Mara struggles to find a spot for the complex and complicated people around her. 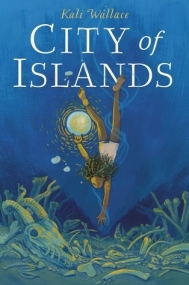 Sorely under-the-radar, CITY OF ISLANDS is a nonstop magical adventure overflowing with heart and daring.